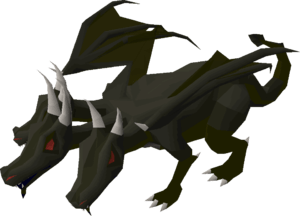 The King Black Dragon is a Black Dragon boss found within the King Black Dragon’s lair in the wilderness. Whilst the entrance to the lair is found within the wilderness, the lair itself is not considered wilderness and you are therefor safe from other players within it. As the King Black Dragon is a Black Dragon, killing him will count towards a Black Dragon slayer task. The King Black Dragon was the first boss monster to be added to the game, way back in Runescape classic. It was often killed by players who were hunting the famed Dragon Med Helm, however, players nowadays often kill the KBD for the chance at the KBD Heads, which allow you to re-colour the slayer helm to black, and also the Prince Black Dragon pet. Players often use either Ranged or Melee at the KBD as viable methods to efficiently kill him. The King Black Dragon uses multiple different Dragon Breath special attacks with differing effects. A Dragonfire Shield or Anti-dragon Shield will reduce the damage of these special attacks by 75% and is highly recommended. You can reduce the damage of these attacks even further by drinking an Antifire potion. This will reduce the damage dealt by the Dragon Breath special attacks to be no more than 10. If you combine the above with the Protection from Melee prayer to protect you from 100% of the KBD’s melee attacks, you will only take a small amount of damage from the KBD’s Dragon Breath attacks. This attack will slowly lower all of your stats. This is not much of a problem with melee as your stats will be restored and raised when using your Super Combat potion. This attack will freeze you in place for 10 seconds, making you unable to move or attack. You should use this opportunity while frozen to eat up and drink any potions you may need to drink. If you don’t mind risking the extra item on your way to the KBD lair, you could bring a Special Attack weapon – even a cheap one like a DDS if you wished. The King Black Dragon uses multiple different Dragon Breath special attacks with differing effects. A Dragonfire Wardor Anti-dragon Shield will reduce the damage of these special attacks by 75% and is highly recommended. You can reduce the damage of these attacks even further by drinking an Antifire potion. This will reduce the damage dealt by the Dragon Breath special attacks to be no more than 10. While ranging, you can avoid 100% of his melee attacks by staying at a distance, but this means he will be using more special attacks and you’ll therefore be taking more damage than a player using melee. There is no need for you to use any protection prayers while ranging. This attack will slowly lower all of your stats. This is not much of a problem with range if you’re using Bastion Potions. However, if you’re using regular Ranging potions you may want to bring a Super Restore potion to bring your defence back up.